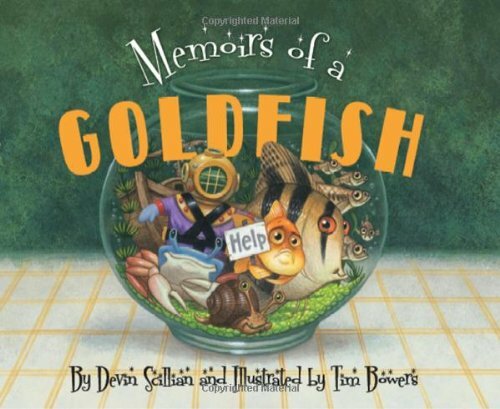 This book, Memoirs of a Goldfish, by Devin Scillian, was our favorite read of the summer. Parts of this cheeky tale remind me of The Day the Crayons Quit which I blogged about here. In this story Goldfish lives a relatively mundane life, swimming circles around his simple fish bowl. Things take a turn for the more interesting when a bubbling deep sea diver, a slime eating snail, an egotistical fish named Cha-Cha, and many others decide to intrude. Goldfish, at first frustrated, soon learns that sharing your space isn’t as bad as he originally feared. It’s a great read for any children about to be introduced to a new sibling, or one who will soon be sharing a room. The takeaway is a great lesson on why sharing ultimately is much more fun than being alone. Just ordered the two sequels – Memoirs of a Hamster and Memoirs of a Parrot too!